I’d always avoided retreat-type holidays. They worried me. Would I end up being herded with people with whom I felt uneasy, over-sharing stories? And what was I retreating from anyway? I love my life. 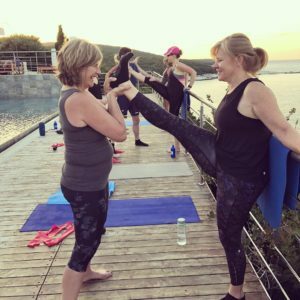 Signing up for Barreworks Retreat in Kefalonia was a decision I didn’t take lightly. But it was made easier in that I know the company. So on a wet Saturday afternoon I found myself unpacking my kit in the Hotel Emelisse in Kefalonia, wondering what lay ahead. The week was carefully structured by the organisers, HHH Retreats, together with Barreworks to offer a mix of fitness classes and other activities such as hikes, HIIT, etc. Two of the regular Barreworks team were there, reassuring us novices that we, as well as the more experienced, would be well catered for. Over the course of the week, they held 11 classes ranging from their signature Barreworks programme, Fusion, Just Stretch and ballet. For me it was a fast learning curve! No more so than in the ballet class – not having ever thought of doing ballet (I was more into ponies as a child), I absolutely loved it. All five of us ballet virgins laughed and stepped our way through the class. The instructor Bridget made it feel easy and delight-filled. Most of the classes were held on the Hotel Emelisse terraces over-looking the turquoise sea. The warm sun, soft breeze, with a sound track of crashing waves relaxed you into holding a pose longer or stretching further. Barreworks’ manager Zhivka offering clear instruction, warm encouragement and repositioning help. If her flexibility and poise is what Barreworks’ routine will give me – I’m in. And then we were on Kefalonia. A small cove near the hotel provided me with all the sea bathing I could want. Long swims early in the morning, late in the afternoon in a startlingly blue sea, warmed by long summer months. Clear water allowed us to see the iridescent green fish that swam nonchalantly around my legs. The week-long programme also included two Emelis Spa massages. Anastasia’s was wonderfully adept and relaxing, and Sotiris’? Well he is a sports massage artist, finding injuries no-one else had ever got near. We also had a boat-trip across to Ithaca – swimming in small coves with the sun, gentle sounds and the sight of a fast-retreating nudist sailing boat! We’d obviously disturbed their peaceful naked corner of the Med. 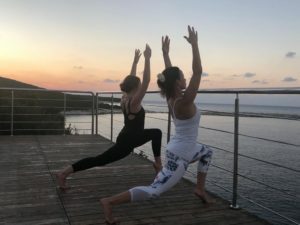 HHH Retreats who ran the retreat added to the programme with 3 long hikes, a series of classes such as HIIT delivered by PT Henlu and for those who wanted yet more exercise – running, cycling and personal training in the well-appointed gym. Other than increased fitness in beautiful setting, the other major change was in my diet. HHH chef Alan cooked amazing food for us all week. 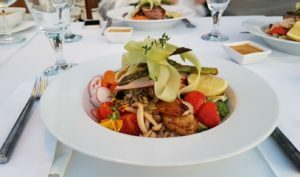 We ate clean – no caffeine, alcohol, sugar, dairy, salt and for me – no meat, carbs or eggs either. I have come back determined to keep as close to this diet as possible as I feel unbelievably well. 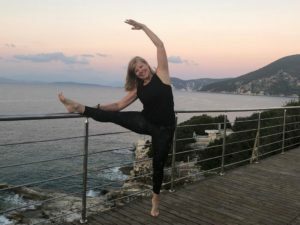 Interestingly having done a DNA Fit fitness and eating profile before I went – the week reinforced what nature had already supplied me in my DNA. And that wonderful feeling of wellness and being in synch with yourself is perhaps the best endorsement of the week.